These very fine bubbles are obtained through the impeller design on the pump and the air venturi intake. As a result, the water�polished and added with oxygen. The unit inlcudes a mathcing power head to drive skimmer unit. This�unit can be�used in conjunction�with an�ozone generator. To be mounted internally into filter tank for easy installation. Deliberate design, beautiful appearance and practical performance sets this skimmer apart from the rest. 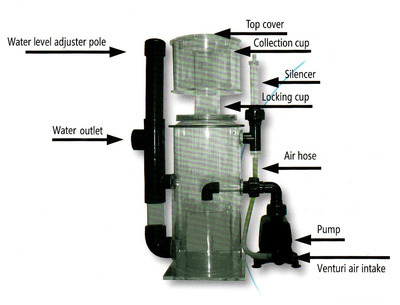 Suitable for aquariums up to 1500lt capacity.